Bridge Retrieval Work Day - October 8 at 9:30 am. 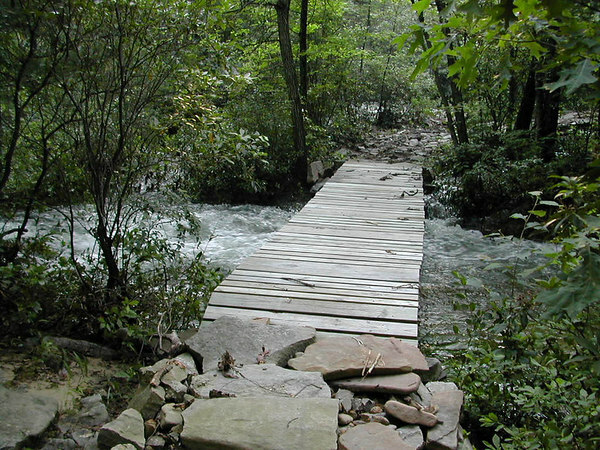 Please try to make the bridge retrieval work day on October 8 at 9:30, meeting at the Rattling Creek end of Doc Smith Trail. Kory would greatly appreciate your responding to him to let him know if you can make it. As mentioned before, he needs at least 10 people for this project and only 4 responded last week. The weather certainly played a big factor last week, so maybe the 8th will see lower water levels for a change with more folks available to help. Please contact Kory at kjmt001@comcast.net . Thanks! Please be careful crossing the creeks where the bridges used to be. There was to be a work session last week, but I haven't heard the results other than seeing they aren't back in place. 9:30 Saturday , 9-24, at the trail head for Doc Smith Trail, Rattling Creek End. Many thanks to Kory Jones for coordinating the bridge retrieval. He'd really like someone there that participated in the last retrieval - Rick nor I are able to be there on Saturday. I'm sharing this e-mail with folks that attended the BASH because some expressed an interest in helping out. Rick wanted to share basic tools you'll need to bring: hammer, crow bar, a saw, rope. These beams are quite a bit heavier than the smaller bridge we moved back last time. A come along or some other mechanical advantage could be helpful if available. A group of at least 8-10 would be the best. Rick can't recall how many fit on the 22 foot beam, but he's thinking somewhere between 10-12 for the 30 foot beams would work. Please let Kory know if you can make it and what tools you might be able to bring. You can contact him at KJMT001@comcast.net Thanks to all. Sorry we will be missing this important session. Bridges Downstream -- Anyone Care to Retrieve? Several fellow-mountainbikers have spotted the bridges downstream. 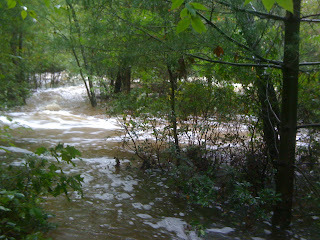 The largest is about 100 yards downstream and smaller is about 1/4 mile own dnot far from Doc-Smith trail. One of the spotters is at the BASH and he commented how there's certainly enough of manpower at the BASH, maybe a bridge-retrieval possy should be organized and go get them. And I said, "would you like to do that??" He didn't (that I know of). The club and those that ride the trails would be very grateful if someone would step forward, take leadership, and organize this effort. As mentioned before, I'd be glad to get the word out via this BLOG and maybe to those who are attending the BASH this year and I'm sure you'd get enough helping hands to retrieve. 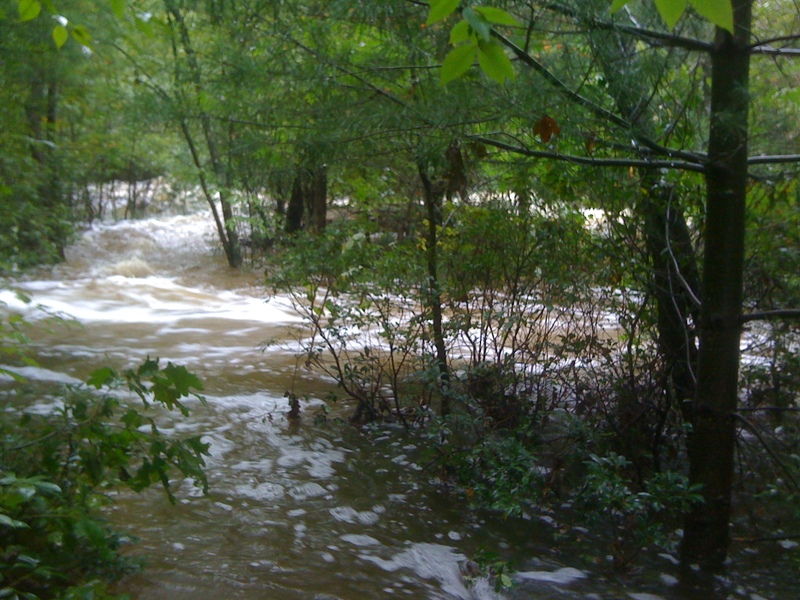 The RCST trails were hammered first with the winds of Irene three weeks ago and now with the rains of Lee. We estimate this area saw somewhere between 12 and 15 inches of rain over a 4-day period and where there's rushing water, there's bound to be some damage. The trees are removable which we've accomplished (the majority of them). The high waters of Lee, however, took its toll on the bridges over Rattling Creek on Rattling Creek trail. They are gone. 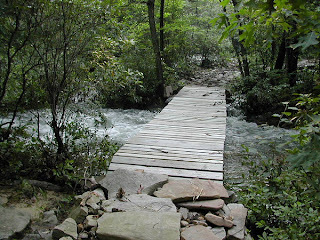 In 2004, Ivan did the same thing with the smaller of the two bridges and the club retrieved the bridge from downstream, dismantled it, and returned it to its home. This time both are gone including the largest 32-foot span. As of today, there are no plans to retrieve. If you would like to take the lead in this effort to rebuild the bridges, let us know and we'll help you get the word out. As for the remainder of the trails after the heavy rain washing, be prepared for more rocks. Many of the trails acted as streams to carry the rushing water and you can visibly see the washing. All are still rideable, but very rocky at spots. Thanks to Clayton for the second photo at high water level on Wednesday after the bridges were washed away. More shots coming later today. Thanks to those of you who e-mailed about helping with cutting trees. We have bigger fish to fry now -- a flood and washed trails. Both bridges are washed out on Rattling Creek trail an anonymous post reported. Rick and I heading to the woods tomorrow to scope the situation out. Not sure how much we'll get "repaired" before the LAST BASH.